A collectible calendar. 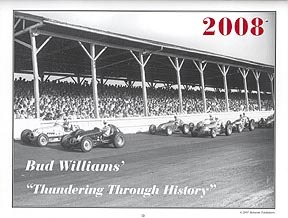 This makes the ninth year for this Bud Williams calendar series! Only the best photos were used for this historic calendar. Featured drivers Bill Holland, Tommy Hinnershitz, Pat O'Connor, Jud Larson, Bill Schindler, Mike Nazaruk, Larry Crockett, Bobby Grim, Jan Opperman, Joe James, Rollie Beale, & Ted Horn.